Following the Monte Carlo Rally, we had the Monte Carlo Rally Historique which took place from the 1 - 6 February, and so yesterday cars were leaving, goodbyes being said. 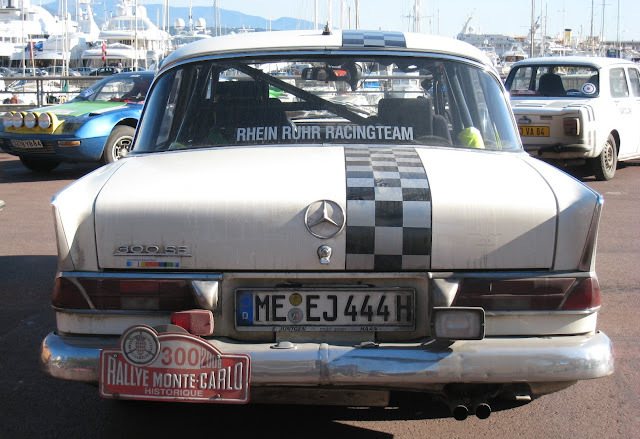 So - if you like looking at dirty old cars, I'll post a few over the next days. Even I know this is a Mercedes. Take a look at the Automobile Club of Monaco's website for more information. Hi Jilly, keep those car photos coming. Monte Carlo must be a great place for petrolheads. When I first looked at the photo, I thought it resembled a car my father had. . . .Then I noticed it was a Mercedes. That wasn't dad's car! BTW. . . .Thanks for the comments on my dogs. They are both so sweet. I would love to have more dogs, if I could. I posted a few other photos on morenashvillephotos, and on Kasey's birthday, I'll have a tribute to her.